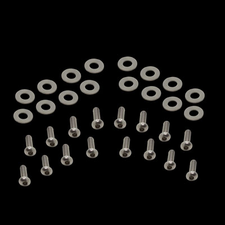 Replace the factory hardware that will rust over time with this Stainless Steel Hardware Kit for your 1994-2004 Ford Mustang. This 28 piece kit replaces all the factory fender bolts. See list below for exact bolts it will replace. Includes 2 extra bolts and washers. Stainless Steel hardware will not rust over time like the factory bolts and it also adds to the appearance under the hood of your car. Includes Hex Key for installation. 1994 1995 1996 1997 1998 1999 2000 2001 2002 2003 2004 Mustang V6 GT Cobra 4.6L Shelby Roush Saleen Vehicles.